Ask fellow campers about "Eau Claire Co. Expo Center" and nearby attractions. This park worked very well for our purpose so I rated accordingly. 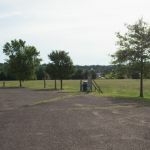 The campground is located on the Eau Claire Exposition grounds. The sites for RVs and other travel trailers that use electric are in a parking lot. We were the only ones there. The contact person said unless there is an event at the Expo Center the campground is sparsely used. Tents sites are located in a field near the picnic area. The Restrooms are next to the picnic area and are clean and well lit. A single spacious shower is available for men and one for women. The park is clean, well lit and safe. However, there is no one on duty all the time. It is not somewhere to stay for a lengthy stay to be one with nature. It is a convenient , clean and safe place to stay on the way to a final destination or if you are involved in an Expo Event. We camped at Eau Claire Co. Expo Center in a Travel Trailer. If there are no events going on these campsites are for rent. The Expo center is easy on/off I-94 and good for an overnight . The location is only a few miles from major shopping and restaurants. The electric sites are 20 amp so you have to decide what you need on. If you have pets there is plenty of room to walk and trash cans to dispose of waste. There is also a walking trail with an honor pay station. Very quiet at night. 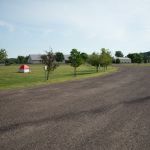 We camped at Eau Claire Co. Expo Center in a Motorhome. Are you affiliated with Eau Claire Co. Expo Center ?